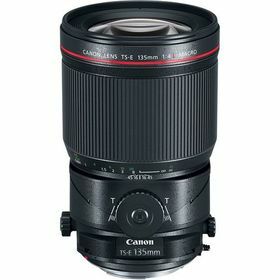 A unique telephoto offering close focus control along with perspective control capabilities the TS-E 135mm f/4L Macro from Canon is a tilt-shift lens well-suited for product and tabletop photography. Up to +/- 10° of tilt is possible, for focus control, and +/- 12mm of shift, to adjust perspective and composition, and a tilt-locking mechanism can be used while shooting for more stability. A minimum focus distance of 1.6' is also benefitted by the range of movements for more control over depth of field when photographing close-up subjects.